'Just let me finish this row darling...': KAN:2 - Getting Worked Up! KAN:2 - Getting Worked Up! Hosted at Napiers iconic East Pier situated at the entrance of historic Port Ahuriri. Like any waterfront location Ahuriri is a vibrant village overflowing with cafes, bars, galleries, deli’s & Napier most famous landmark, the Art Deco Rothmans Building. The K.A.N:2 venue has unimpeded views onto Hawkes Bay & sits adjacent to the Harbour View Motor Lodge. K.A.N Registrations are now open. This includes: Access to exclusive Traders Market, ONE workshop, Design Spun factory Tour & Skeinz shop visit, access for free knit time at East Pier, public traders market & a KAN goodie bag. This includes: Access to exclusive Traders Market, TWO workshops, Design Spun factory tour & Skeinz shop visit, access for free knit time at East Pier, public traders market & a KAN goodie bag. PLUS the KAN Retreat Dinner & Awards on Saturday Night. East Pier is a landmark Napier Eatery & will be providing a three course dinner designed especially for KAN (drinks own care). This includes: Access to exclusive Traders Market, THREE workshops, access for free knit time at East Pier, public traders market & a KAN goodie bag. PLUS the KAN Retreat Dinner & Awards on Saturday Night. East Pier is a landmark Napier Eatery & will be providing a three course dinner designed especially for KAN (drinks own care). KAN’s preferred accommodation provider is Harbour View Motor Lodge. Call toll free 0800 668 432 or http://www.harbourview.co.nz/ – Hosts George & Zoe. This year I am encouraging retreat goers to arrange their own accommodation. I have a number of rooms set aside for Retreat goers at discounted rates – these are booked under ‘Maree’s Knitters’. I am setting up an accommodation thread on the Ravelry KAN group for people to arrange their own roomies, prices & room configurations will be there. If you get stuck, email me & I will help get you placed with other retreaters. Other accommodation options within walking distance from the venue. Also check out www.holidayhomes.co.nz & enter ‘Ahuriri’ into your search. Mastering Entrelac - Susan Hagedorn will be demystifying this alluring style, Entrelac is a knitting technique that creates a stunning textured plaited or diamond patterns. Entrelac can be knitted flat or in the round, often using colour or textured stitches to create different patterns and effects. This workshop will introduce the method of knitting squares and triangles in different orientations to make textured fabric. The technique can be adapted for use in garments, blankets, bags and accessories. Skills required for this Entrelac Workshop are ability to k2tog, p2tog and pick up stitches knitwise and purlwise. Ideal for advanced beginners upwards. Getting set from the Top Down - Turn traditions on their head when you learn how to master top-down seamless set-in sleeve construction. Seen more and more, a technique that is a revelation to your knitting style once mastered. Morag McKenzie is one of NZ’s most accomplished tutors & the owner of Vintage Purls yarn boutique. This workshop is excellent for people who have started working in the round & want to expand the technique or those budding designers who want to sharpen up on the hottest design trend of the last few years. Knit a mini jersey that gives you all the skills to translate into a garment for yourself. Get the right fit and never sew in a sleeve again. Intermediate – Experienced knitters. It’s Hip to be Square - Nanette Cormack from Yarnz works her magic with colour & translates modular quilting ideas into knitting. A great workshop if you love colour and have plenty of unused stash to transform into something wonderful. This workshop is very satisfying as the techniques are easy to learn & you can achieve a great deal in a short time. You just need to know how to knit, purl - great for beginners upwards. Discover Area 51 - Nanette will give you the chance to clear out those UFO’s & help motivate you to complete them or redesign them into something new. She will help inspire & guide you around online searches & other resources. This is the perfect time to dig out those project bags gathering dust & reinvigorate them, or alternatively if you have yarn burning a hole in your stash but struggling to find an ideal pattern this is the session for you. A very relaxed low key session, knit, chat, search, brainstorm all over some coffee & cake. – Beginners upwards. Knitting with Unspun Fibre - Why should the spinners have all the fun?! Beautiful handyed spinning fibres can be used as yarn, and the knitting can then be stabilised by felting. Learn how to prepare hand dyed top for knitting, make a project or two and take away a piece of knitting ready to felt. We will also explore knitting with silk hankies. The tutor will provide: 115g merino top, a silk hanky and full instructions and patterns for you to take away. Extra fibre will also be available for purchase. You need to bring: 10mm needles (80+cm circular if possible), darning needle, scissors. About the Tutor - By day Jessicah works in a microbiology lab, by night she hand dyes fibre and yarn in her home studio as Spinning a Yarn. She can usually be found surrounded by multiple projects in various stages of completion. Knit to Fit - Sick & tired of starting a large project, especially for yourself, toiling away for months only to finish it & be completely disappointed by the results! This is the workshop for you, after a couple of hours here you can feel confident in: Finding patterns to suit different body types. Explore examples of what a pattern fails to tell you. How & why patterns will not fit & making the necessary adjustments so that it will! Lyn Adell’s passion for knitwear shows in her creations. Read & see more of Lyn Adells creations here at her website. Beginners Upwards. Drop Spindling - Hot from Homemade in Wellington, Frances Stachl will take her very popular Drop spindling tutorial. Learn this ancient technique that will have you make yarn right before your eyes. She will be bringing some of her stunning hand crafted spindles to KAN - works of art on their own! You’ll need to book quickly for this tutorial, interest is already very hot! – All skill levels. Seeing Double - James Herbison will take you through the technique of knitting with two strands to create a reversible contrasting fabric - a wonderful technique to master for scarves, hats, wraps, bags, anything that you would like to have fully reversible. James will challenge you to stretch the boundaries for colour & design – James is a fun vibrant tutor, the hours will fly by! – Advanced Beginners upwards. It’s a Wrap! – Hand knitted shawls & wraps are one of the most popular accessories in fashion today. Morag McKenzie will take you through traditional shapes (e.g. triangles, squares and circles) and other constructions. Examine how to fit stitch patterns into a chosen shape and the pros and cons of each. You'll learn the skills to build your own patterns and advice on the best yarn selection, stitch patterning & finishing for your vision. Intermediate upwards. Getting the Chop - Norwegian Steeking with Stella Lange. Imagine taking a pair of sharp pointy scissors and cutting into your hand knitting! Most hand knitting here in New Zealand is knit to shape using printed patterns as guides, but not all knitters shape their knitting that way. Many people shape their hand knitting by cutting, folding, neatening and picking up stitches. This is called Norwegian Steeking and is what we will be doing in this workshop. Yes cutting your first steek is at once exciting, scary, terrifying and full of danger – and some would say a rite of passage for any adventurous knitter. 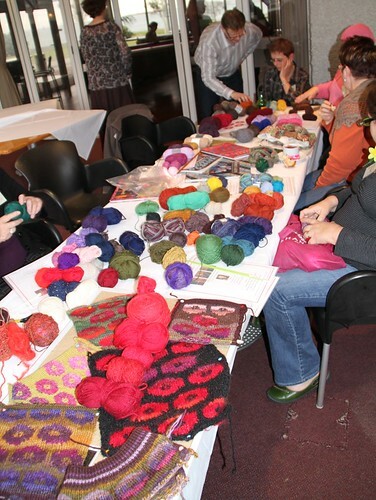 This workshop invites you to steek and finish samples using only the knitting tools you already have in your knit kit, yarn, darning needle, knitting needle, crochet hook, scissors. You will steek one knit sample and create two edges, finish one as a folded facing and the other with a knit on edging. During the class we will look at the various methods used to construct a steek and finish it in a garment, as well as ways of using steeks in general knit projects. Stella is a lecturer in Otago who is best known to Ravelers as knitfrogknit. She can be found musing away on her very entertaining blog - KAN:2 is very excited to be luring Stella so far north! On Sunday morning (9am – 12pm) KAN will open to the public for a Sunday Knit Market. This will be extensively promoted through local media & retail outlets. We would love to have you take part. Stands are only $40 each & we provide one trestle table & a couple of chairs. Last year we saw hundreds of knitters flow through & plenty of traders going home with empty cases! Email Maree if you're interested. I hope to have my very own KAN website up & running soon, so please bear with me if not all payment options are available immediately, but I know as many have to travel, it's good to get organized as early as possible. Top 5 tips to finding the perfect yarn for the job.